After nearly eight years of working with Massachusetts Gov. Deval Patrick, I joined Northwind Strategies. I serve as vice president for public relations at the Boston-based strategic communications firm, where I work with political, corporate and nonprofit clients to achieve their goals. I also teach political communications courses at Emerson College, Simmons College and Northeastern University, and am a regular television commentator on politics for WBZ and NECN. Loren Bach finished medical school and is starting a general surgery residency at the University of Minnesota. He and his wife are expecting their first child this summer. David Fried was ordained as a rabbi by the Yeshivat Chovevei Torah Rabbinical School. Guillaume Buell rejoined the New York City law firm Cahill Gordon & Reindel as a litigation associate. 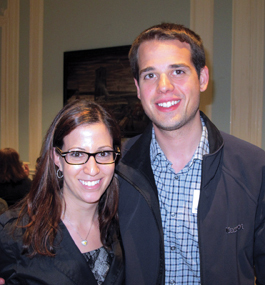 Adam Turek-Herman and Lauren Katz ’08 were married in November 2012 on Long Island. They were surrounded by several of their Brandeis friends. Amanda Martin Hordos and her husband, Jonathan, welcomed daughter Idina Jane into the world in October 2012. Troy Trejo’s health-care consulting company, Trejo Consulting, is now part of Stroudwater Associates. Troy works with health systems, focusing on operational improvement, integration and preparation for the “post-reform” future of health-care delivery. He hopes to reconnect with fellow alumni working in health care and other sectors. Judy Mark Kaufman and Alex Kaufman announce the birth of a baby girl, Daniella Rose, on March 3. Daniella can’t wait to meet all of her Brandeis family. Amanda, Heller MPP’10, and Charles Koppelman-Milstein welcomed a son, William Lev, on Oct. 9, 2012. He has enjoyed meeting several Brandeis alumni, including Ava Morgenstern; Daniel Muenz; Judy Lattimer, MS’06; Nina Schwartz ’05; and Abigail Wiener Shapiro. Rebecca Hanus started her first year of law school while finishing up her PhD in social work. She recently presented at the Aging in America Conference. She is an adjunct professor at Yeshiva University’s Wurzweiler School of Social Work, works in business development at Jewish Home Lifecare and also has a private practice in New York. Matt Shuman teaches eighth-grade world history at Boston Preparatory Charter Public School and lives in Jamaica Plain, Mass. Andrew Davies is co-founder and executive director of the Bible Players, a Torah comedy show based in New York. Since starting the Bible Players in 2011, Andrew and his co-star have brought their show “The Bible Players and the Quest for MenschHood!” to more than 100 schools, synagogues and camps, from Chicago to Texas. Check out their website at www.thebibleplayers.com. Loretta Stein, who graduated from Tufts Medical School, is an ophthalmology resident at the Naval Medical Center San Diego and a lieutenant in the U.S. Navy. She also has a master’s degree in global health from the University of Oxford. Loretta recently had an article published in the journal Mycoses, and has taken up surfing. Kayla (Liebman) Bellin opened a boutique flower shop in Newton Centre, Mass. Bloomsbury Park Flowers blends European-inspired tradition with contemporary design. For more information, visit bloomsburyparkflowers.com, or see the company’s Facebook page. Liz Steinfield graduated from the Boston University School of Medicine in May, married Justin Seashore on June 1, then started a residency in pediatrics at NewYork-Presbyterian Hospital in New York City in mid-June. Amy Padva and Christopher Young ’05 were married on Jan. 13 at the Westbury Manor on Long Island. They met while serving in the Brandeis Emergency Medical Corps. Their wedding ceremony celebrated their love for each other and the values they cultivated while at Brandeis. They live in Huntington, N.Y. Joining in the celebration were Oren Bachar ’05; Hanna Berenblit ’05; Mara Blumenthal; Nora Crowley; Richard Frank; Amy Goldwasser; Michelle Junger ’05; Ben and Anna Kaplan ’05; Dara Klein; Sarah Levinson; Rachel and Greg Viking­stad ’05; and Na-Young Weaver ’05, MA’07. Joanna Gang married Kent Sanderson in January. David Ostrowsky is writing a book, “Where Are They Successful Now: How Former Pro Athletes Leave Sports and Enjoy the Game of Life,” due out in the fall or winter. The book profiles one-time pro athletes who have made contributions in the fields of entertainment, business, politics, community service, coaching, management or broadcasting upon retirement. Athletes profiled include David Robinson, Dikembe Mutombo, Steve Finley, Scott Brosius, Butch Hobson, Tony Amonte, Vladimir Guerrero, Dolph Schayes, Ron Mix, Kevin Johnson, Warrick Dunn, Ron Washington, Shawn Kemp, Mo Vaughn, Kellen Winslow, Corliss Williamson and Allan Houston. Ken Goff, MA’07, moved to San Francisco in February to join the investor-relations team at Facebook. Ken is applying his past experiences with the IPO process to help build a world-class investor-relations program at the recently public company, as well as enjoying all the great things the Bay Area has to offer. Joshua Simmons authored an article, “Inventions Made for Hire,” for New York University’s Journal of Intellectual Property and Entertainment Law. The article compares 19th-century developments in copyright law and patent law that resulted in copyright law’s developing a work-made-for-hire doctrine; patent law, on the other hand, developed only a patchwork of judge-made employment doctrines. The article theorizes that patent law did not develop an inventions-made-for-hire doctrine because inventive activity was almost exclusively perceived to be performed by individuals. 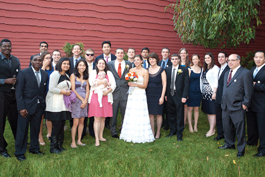 Twenty-two Brandeis alumni celebrated the marriage of Amy Silverstein and Dan Galinko on Oct. 14, 2012. Attendees included Azeez Aranmolate, MS’08; Selom Doamekpor; Kim Cohen; Adam Marks; Vikram Ranade; Mitali Kamdar; Jeff Weiner ’92; Paul Flynn; Maggie Del Cid-Haines; Emily Unger; Calvin Cheung, MA’07; Glenn Landauer; Krish Dutta; Karen Galinko ’75, P’06, P’07; Matt Galinko ’07; Rich Frank; Dara Klein; Shoshana Speiser; Karen Goldfischer; Josh Goldfischer; James Kasper ’71, MFA’73; and Will Lam ’05. Amy and Dan reside in New York City. Valerie Gorbulov married David Rafkind on Feb. 17 at the Hampshire House on the Boston Common. Layla Schuster ’03 was maid of honor, and Mary Guzelian ’02 served as a bridesmaid. Amanda Rosenfield joined Simpson & Simpson in Buffalo, N.Y., as an associate focusing on intellectual property. She received her JD from the University at Buffalo School of Law. Edgar Ndjatou is of counsel at the Washington, D.C., employment law firm Dhali. A member of one of the first classes of Posse, the innovative college-access program founded by Deborah Bial ’87, he serves on the organization’s national board. Edgar spoke to prospective Brandeis students at an admitted-students event hosted by the Office of Admissions in April. MEDIA MATTERS: Lisa and James Keith, both ’06, attended a Faculty in the Field event in New York City with Tom Doherty, professor of film studies, who discussed his new book, “Hollywood and Hitler, 1933-39.” More than 60 alumni attended the event, which was co-sponsored by the Alumni Club of New York City’s Media Network. THE PLEASURE OF THEIR COMPANY: A large contingent of Brandeis alumni attended the wedding of Amy Silverstein and Dan Galinko, both ’06. Front row, from left: Selom Doamekpor ’06; Mitali Kamdar ’06; Maggie Del Cid-Haines ’06; Emily Unger ’06; Lucy Unger (Class of 2033? ); Dan; Amy; Karen Galinko ’75, P’06, P’07; and Matt Galinko ’07. Back row: Azeez Aranmolate ’06, MS’08; Vikram Ranade ’06; Kim Cohen ’06; Adam Marks ’06; Jeff Weiner ’92; Paul Flynn ’06; Calvin Cheung ’06, MA’07; Glenn Landauer ’06; Krish Dutta ’06; Rich Frank ’06; Dara Klein ’06; Shoshana Speiser ’06; Karen Goldfischer ’06; Josh Goldfischer ’06; James Kasper ’71, MFA’73; and Will Lam ’05.